PM Modi and Israel PM Netanyahu pay tribute at Teen Murti Haifa Chowk in Delhi. PM Modi and Israel PM Netanyahu arrive at Teen Murti Chowk, received by Army Chief General Bipin Rawat and Foreign Secretary S Jaishankar. PM Modi and Israel PM Netanyahu attend a ceremony to mark the formal renaming of Teen Murti Chowk as Teen Murti Haifa Chowk. PM Modi receives Israel PM Netanyahu at Delhi airport. Israel PM Benjamin Netanyahu arrives in Delhi. Prime Minister Narendra Modi arrives at Delhi Airport to receive Israel Prime Minister Benjamin Netanyahu. Israeli Prime Minister Benjamin Netanyahu on Sunday arrived in India on a six-day visit during which both the strategic partners aim to further expand ties on a range of key areas including defence and trade. 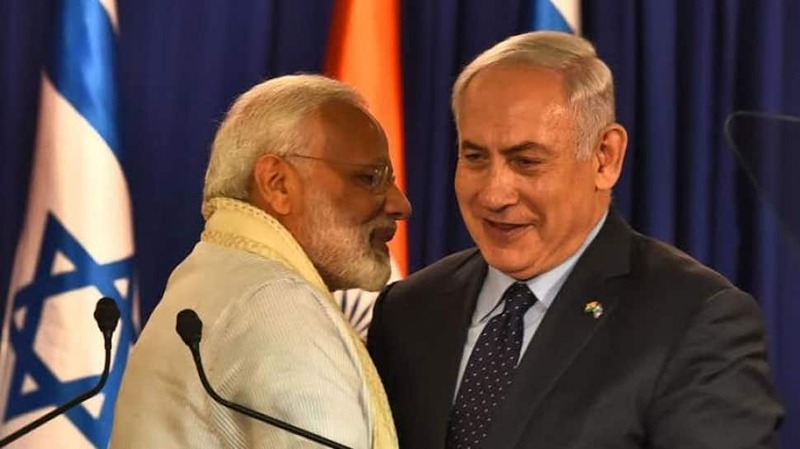 Prime Minister Narendra Modi and Netanyahu will hold talks on Monday covering entire expanse of the ties and explore new areas of cooperation to further deepen the "very very special relationship", the external affairs ministry had said on Thursday.